I created a PowerShell script, CreateRelease.ps1, that creates a new release for the specified release definition name, using the latest artifact versions available. I created a new “wrapper” release definition, that has multiple “Run a PowerShell script” steps that run CreateRelease.ps1, for each release definition I want to create releases for. This is really nice content in VSTS but i have some doubts in this which is listed below. 1. 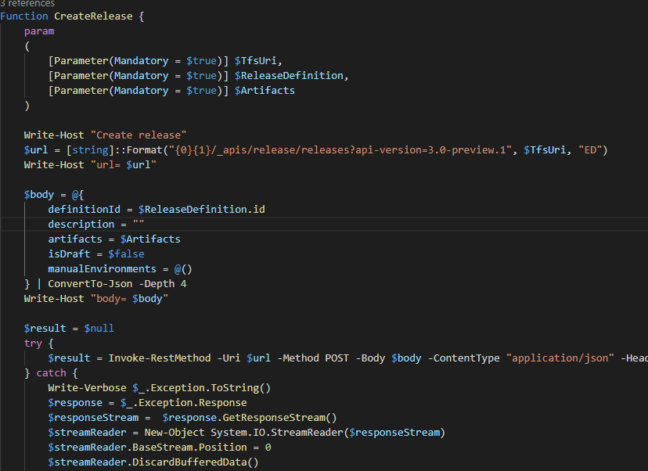 Where can we define ReleaseDefination Name? 2. I have created one release definition with the specific version. can you please explain how can i trigger that release with powershell from another release definition?